Bhutan | What else do Buddhism and GNH share in common? What else do Buddhism and GNH share in common? Timphu, Bhutan -- Buddhism was so pure when it was born and first delivered to the world. Since then the great vehicle of compassion has been through an evolutionary process of constant change. Today, the way we practise the religion begs the question of whether it is already corrupt? If it is so, then it is a sign of the times. And it is only fitting to explore whether our other values have also suffered the same fate. 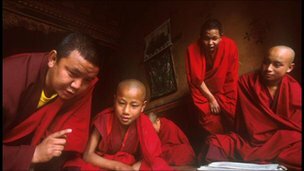 << Monks in Bhutan: "GNH and Buddhism rae like peas in a pot"
The religion has become a sanctuary of some sorts for the unsuccessful and the ambitious. Our practice of it is overwhelmed by the ever increasing reliance on it for success and protection. We have somehow settled down in the belief that praying for the well being of all beings somehow secures our own well being too. Every religious action is linked to our own welfare. We deliberately defy logic and common sense, and believe that our prayers have the “power to liberate” all beings. Numbers seem to matter the most as we target millions and billions bead by bead parrot-fashion. What is expected of us as Buddhists hardly becomes a source of inspiration for our practice? No matter how hard we try to believe in the inerrancy of the religious beliefs that we hold, and acknowledge the power of faith in our lives, it is difficult to wrestle down the inexorable view that Buddhism is certainly not about all these. In a way, we have succeeded in ‘customising’ the religion to suit our own existence. When Buddhism actually requires us to remain aloof from worldly desires, we tend to use (or misuse) it to reach to those desires. We have become selfish to the extent that we are not even willing to accept what divine providence has to say about us through the numbers on the dice. We roll and reroll it, until the number that lands on the top of it is interpreted in our favour. As Buddhists, it is challenging to clear one’s way out of the contradiction involving contentment and selflessness on the one hand, and the fervour with which we observe the rites and rituals with a rather strong material objective on the other. Our religious beliefs may be sacrosanct, but challenges such as these do haunt and fluster the ever inquisitive Buddhist minds, who try to make Buddhism relevant in their lives. Buddhism and GNH appear like peas in a pod, at least in the way we have come to develop our understanding, expectation and the practice of it. Of course, associating the great vehicle of compassion with a development philosophy would be inapt, as the latter pales in comparison to the former by many measures. It nonetheless provides an opportunity to show how GNH too could have been possibly corrupted by the same people, who have corrupted Buddhism. We are adamant in simplifying the great philosophy into something as narrow as individual happiness, and see it as a pair of hands that feeds and clothes every individual. Such association of the powerful concept with individual happiness only goes to show how it has become corrupt. How could Bhutan ensure individual happiness, when rich nations like the US and Japan could not? We would be only chasing rainbows in trying to deliver happiness to every individual. It will never be achieved no matter how hard we try, for there is no limit to people’s desire for happiness. When it is in our culture to maintain the lifestyle of the rich, while our bank account might be suffering, how do we sustain such happiness? We have advocates of happiness for the masses, who slam GNH as being “ineffective”. But what is missing in their action is the will to nip something in the bud that will get them to their first base - corruption. There is so much in the rhetoric, but almost nothing in what can actually help achieve what they are advocating and championing. Perhaps the road to hell is paved with good intentions. There is no denying that GNH represents a basic covenant between a nation and its people. But to say that that is the be-all and end-all in our grand scheme of things is debasing the powerful concept. We have to be prepared to take the rough with the smooth, if we believe the Buddha nature in us is still not corrupt. There are those, who chafe under the popular version of the GNH philosophy, wringing their hands to see that the concept be given the due respect and regard it deserves by the Bhutanese themselves first for what it is. We ought to understand that GNH is a common vision for our planet and its well-being. We ought to understand that it is about how we figure in the invisible cost of development in our calculations. We ought to understand that it is about assigning value to everything that is around us. That is why it is quite uncommon to be hit by a pang of realisation that perhaps we might have completely missed the wood for the trees. But it is not that we do not know about it. We simply do not want to know about it. Sadly, there is a broad public apathy about what GNH is capable of. We want Gyalwong Gakid Pelzom to be dancing right in the middle of our living room. We are in pursuit of our own individual happiness. We have failed to recognise that GNH has come to symbolise the indefatigable spirit of a selfless King in pursuit of a fundamental change in the way we approach advancement into the future. And he needs our support to give it shape. But we are like ships that pass in the night when it comes to working together on GNH and providing him that support. Consequently, we still do not have a basic agreement on what constitutes GNH for us as Bhutanese. It might seem like a red rag to a bull, but it stands to reason that a people that have only their individual happiness in mind will never appreciate the greatness of the profound concept. That way, we are all perhaps complicit in debasing a great vision. We simply write off GNH as an abstract philosophy and a utopian quest. Buddhism too is an abstract philosophy, and it does not even have an index to measure how enlightened one is. Yet, it has worked and accepted the world over, for and by those, who understood what it truly is, and who have not succumbed to self-serving impulses. How we give GNH the right kind of support depends on how we understand it and appreciate its potential. We cannot afford to have a seven-year itch, for GNH is our conviction. And it has to be the best. But we cannot make a silk purse out of a sow’s ear. Everybody needs to pitch in with their best. For now, the real concern is that GNH is being corrupted faster than Buddhism. While it took about 2,500 years for the latter to get corrupted, the former took just 40 years. At this rate, we seem to be fighting a rearguard action against the forces from within our backyard. This, coupled with our relentless pursuit of trying to “extract” happiness out of GNH, we will have only ourselves later to blame for stifling the great philosophy to a mere shadow of what the thinker has originally envisioned, and have it sacrificed on the altar of individual happiness.